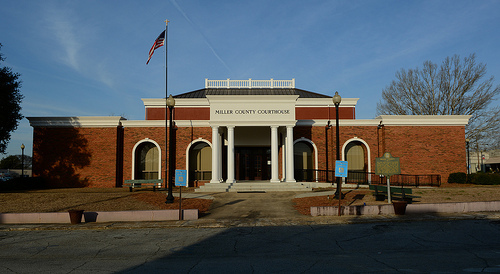 County probate courts exercise exclusive, original jurisdiction in the probate of wills, administration of estates, appointment of guardians and involuntary hospitalization of incapacitated adults and other individuals. In counties with population greater than 96,000, a party to a civil case may request a jury trial in the probate court by a written demand with the first pleading. Appeals from such civil cases may be to the Supreme Court or the Court of Appeals depending on the particular matter. Most probate court judges are elected to four-year terms in countywide, partisan elections. A candidate for judge of the probate court must be at least 25 years of age, a high school graduate, a U.S. citizen and a county resident for at least two years preceding the election. In counties with population over 96,000, a candidate for probate judge must have practiced law for seven years and be at least 30 years of age. Magistrate Court jurisdiction includes: civil claims of $15,000 or less; certain minor criminal offenses; distress warrants and dispossessory writs; county ordinance violations; deposit account fraud (bad checks); preliminary hearings; and summonses, arrest and search warrants. A chief magistrate, who may be assisted by one or more magistrates, presides over each of Georgia’s 159 magistrate courts. Magistrates may grant bail in cases where the setting of bail is not exclusively reserved to a judge of another court. No jury trials are held in magistrate court. If a defendant submits a written request for a jury trial, cases may be removed to superior or state court. The chief magistrate of each county assigns cases, sets court sessions, appoints other magistrates (with the consent of the superior court judges) and sets policy for the magistrate court. The number of magistrates in addition to the chief is usually set by majority vote of the county’s superior court judges. Most chief magistrates are elected in partisan, countywide elections to four-year terms. The chief magistrate may be appointed, if so provided by local legislation. Terms for other magistrate judges run concurrently with that of the chief magistrate who appointed them. To qualify as a magistrate, an individual must reside in the county for at least one year preceding his or her term of office, be 25 years of age, and have a high school diploma or its equivalent. A magistrate court judge may also serve as a judge of another limited jurisdiction court in the same county.